We are dedicated to making your day special and will help in any way we can. Our trusted and capable suppliers can supply you with flowers, venue decorations, cakes, favours, sweet table, caterers & photographers. 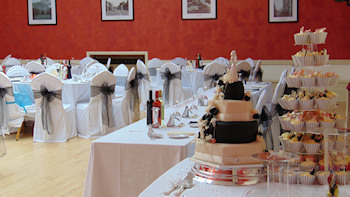 Our wedding organiser, Jan, has great experience of setting the hall up beautifully and she makes events flow with ease. We will provide your guests with a professionally run bar. 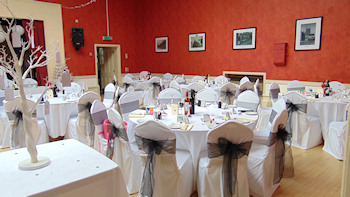 The inclusive hire package of £1000 will reserve the Corn Exchange for your sole use FROM 4pm FRIDAY to 12 noon SUNDAY. This will include meetings and support with our experienced wedding co-ordinator. 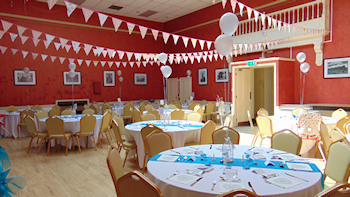 The wedding package comes with the full use of the following: main hall, café area, kitchen, use of banqueting tables and chairs as well as crockery and cutlery, easel or tree for seating plan, red carpet in entrance hall, and Theatre Bar area (a bar can be provided for events with over 50 people attending). With this package the hall hirers are responsible for setting out tables, chairs etc, as well as all clearing away (sweeping, emptying of bins, storing tables and chairs away). Optionally, we can take care of this for you, please see options below. Weddings require a non-refundable £350 deposit at the time of booking. Plus a refundable deposit of £150 to cover any damage. Deposit for hire of cake stand is £50 (to be refunded of reception). To be paid in full one month before wedding. Please do not hesitate to contact us if you would like to discuss a personalised wedding package or to arrange a viewing. Spacious hall with wooden flooring which makes it ideal for dancing. There is a stage, with stage lighting and a wireless PA system, which means any performers/acts can set up on stage, without taking up valuable floor space. We have alcohol and entertainments licenses and are able to host events until 2am. We are able to offer a high-quality wedding reception, dining/seating plan that could comfortably accommodate 100 guests plus top table/s. The main hall using the existing format above could in conjunction with the Theatre bar/Café Area could achieve a figure up to 200 guests. The maximum number the main hall can accommodate using only close seating plan is 225 guests. If you are having an evening party or disco, then you may also hire the hall on an hourly basis or set times.